The HadNMAT2 data set is a monthly global field of night marine air temperature (NMAT) on a 5° latitude by 5° longitude grid from 1880 to 2010. The data have been adjusted to minimise the effects of changes in the height of the thermometer above the sea surface and for non-standard thermometer exposure during the Second World War. Uncertainties in the gridded fields and time series have also been estimated. The data are neither interpolated nor variance adjusted. The data set runs from 1880 to 2010. 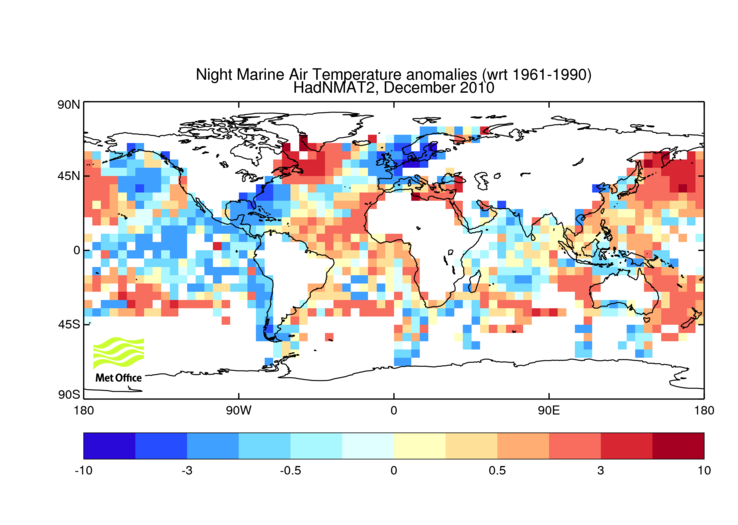 The NMAT data are taken from version 2.5 of the International Comprehensive Ocean-Atmosphere Data Set, ICOADS (external web page), from 1880 to 2010. HadNMAT2 is produced using in-situ measurements of marine air temperature made on board ships between one hour after sunset and one hour after sunrise. Measurements that fail quality checks are rejected and the measurements are converted to anomalies by subtracting climatological values from the measurements, and calculating a robust average of the resulting anomalies on a 5° by 5° degree monthly grid. After gridding the anomalies, bias corrections are applied to reduce the effects of spurious trends caused by changes in deck height on non-standard thermometer exposure. The uncertainties due to under-sampling and measurement error have been calculated for the gridded monthly data as have the uncertainties of the bias adjustments following the procedures described in the paper. For a detailed description of the dataset and its production process, please read the paper describing the data set. We recommended you read the paper before using the data. Data are now available from the download page without charge for the purposes of private study and scientific research, but please read the terms and conditions.